INDIA: Park rangers in India are using a cuddly toy tigress to help three traumatised cubs spring back to their feet after the death of their mother. 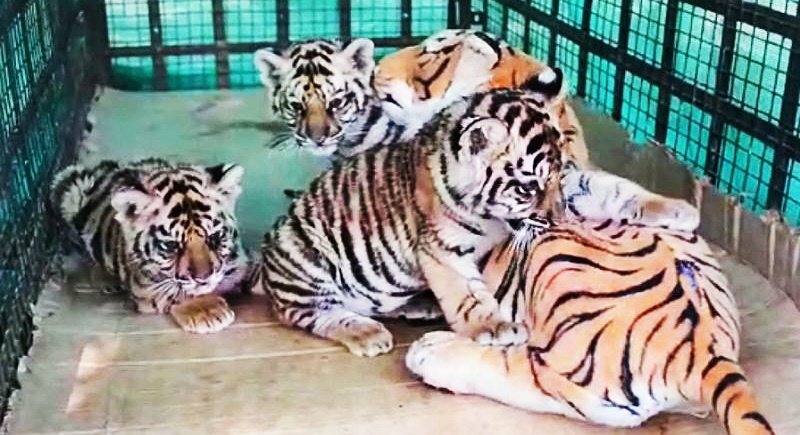 The cubs, who were orphaned last month, have been happily feeding from milk bottles fitted inside the toy, said the field director at Bandhavgarh Tiger Reserve in the central state of Madhya Pradesh. “We tried to give them goats’ milk initially but they didn’t like the human interaction. They just refused to take the bottle from our staff,” Mridul Pathak said. Forest rangers have also built a special enclosure for the cubs inside their compound, using twigs, grass and sand to mimic their natural habitat, he said. The cubs were found in a critical condition not long after the body of their mother was discovered near a river in January. It is believed the mother was killed after brushing against an electric fence erected by cattle farmers, Pathak said. An investigation is ongoing. Rangers quickly treated the cubs for dehydration and rushed them back to the enclosure. The tiger treatment has a precedent. In rural India it is common to keep dummy calves next to cows and buffaloes who stop lactating when they lose their offspring. The sense of attachment encourages the mothers to begin producing milk again. India is home to more than half of the world’s tiger population with more than 2,200 roaming its reserves, according to the most recent census in 2014. At least 98 big cats died last year, said the National Tiger Conservation Authority, with poaching blamed in most cases.